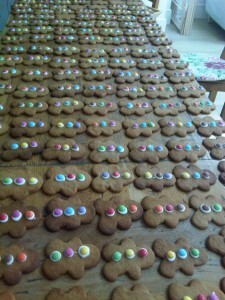 After the amazing success of last year’s café another café was held on Saturday 22nd November. Over 4 thousand NZ dollars was raised ! This 5k fun run took place on 22.11.2014. The event the previous year was a great success and over the 2 years also 3 thousand pounds was raised . 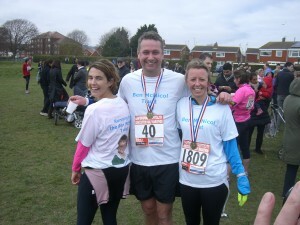 You can learn more about Meads Runners at www.meadsrunners.co.uk . You can donate through JustGiving . Event :The Glasgow Half Marathon 05/10/2014 . Supper and entertainment , Nailsea , Bristol on 18/10/2014 . Thank you to everyone who supported the Café , over 1000 pounds was raised !!! Thanks to everyone involved and to everyone who supported the Café . OVER THE PAST FEW WEEKS DIFFERENT SUPPORTERS IN DIFFERENT PLACES COVERED OVER 100 MILES IN SUPPORT OF THE BEN MCNICOL TRUST , FIND OUT WHO DID WHAT ON THEIR JUSTGIVING PAGES - DEVON , GLASGOW AND LONDON ! EVENTS HAVE OR WILL BE TAKING PLACE IN ENGLAND , NEW ZEALAND , SCOTLAND , AUSTRALIA AND GERMANY- CAN YOU ADD TO THIS LIST AND ORGANISE AN EVENT !! We are so grateful to Bede’s School , Eastbourne for supporting The Ben McNicol Trust over the past year , thank you to all the staff , children and parents . 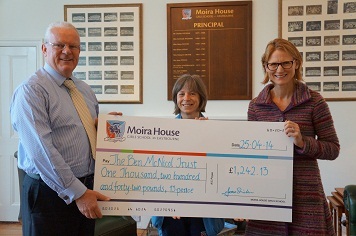 Thank you to everyone at St John’s Meads Primary School and St Andrews School Meads for continuing to support The Ben McNicol Trust . Thank you also to Moira House School , Eastbourne for the fantastic swimming event on November 29th and to all who took part . PLEASE KEEP YOUR EYE ON OUR JUSTGIVING SITE ALSO TO SEE WHAT IS GOING ON ! Thank you once again to Jonny for raising even more money on yet another run , the latest being the Hasting Half Marathon , we are losing count of the number of runs now – THANK YOU SO MUCH ! Do support Natalya following her amazing 2km swim – what a great achievement , you can donate on her JustGiving page ,over 800 pounds raised to date . Thank you to Nisha who has raised in excess of 600 pounds – you can still add to this total through Justgivng . Thank you very much for all the money raised from the cinema evening and for Janet for donating the proceeds from the sale of her cards . 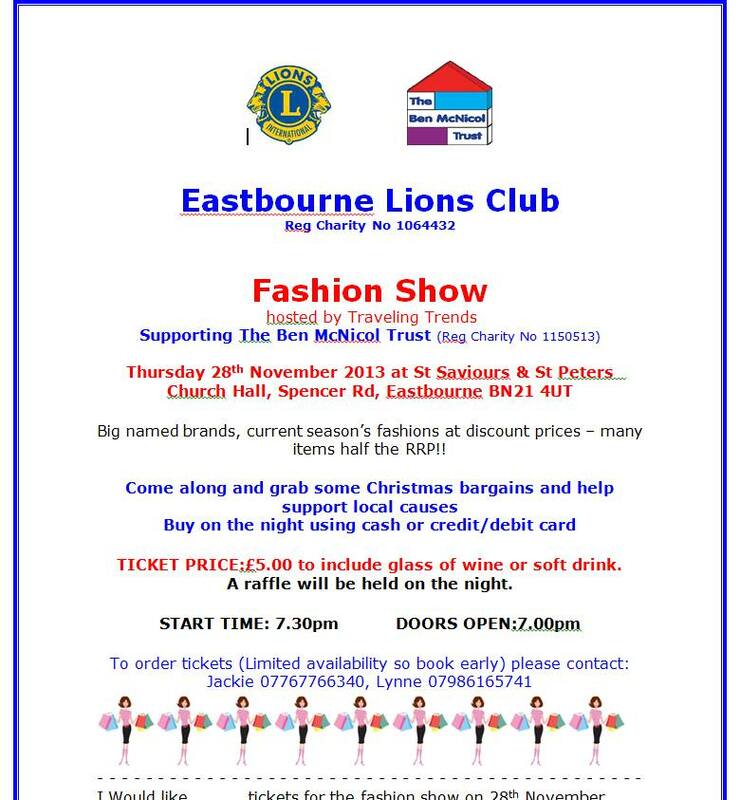 After the success of last year’s fashion show The Eastbourne Lions put on a second show just in time for summer. Held on Wednesday 18th June at The Lansdowne Hotel , over 450 pounds was raised . Thank you . Six Bristol Mums will be cycled 85 miles from Ilfracombe to Plymouth to raise money for the Ben McNicol trust. Sarah Bushell, a close friend of the McNicol family decided to rally together a group of her friends and neighbours to take on the cycle challenge. The six set off from Ilfracombe on the North coast of Devon on Saturday 21st June cycling to Plymouth on the south Coast by Monday lunchtime. You can support them and donate to the rust through their JustGiving Site . 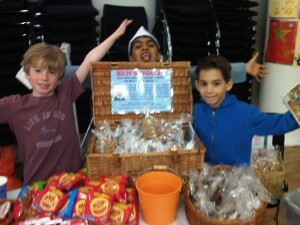 Thank you to everyone contributing towards Morning Tea and for donations received to date . 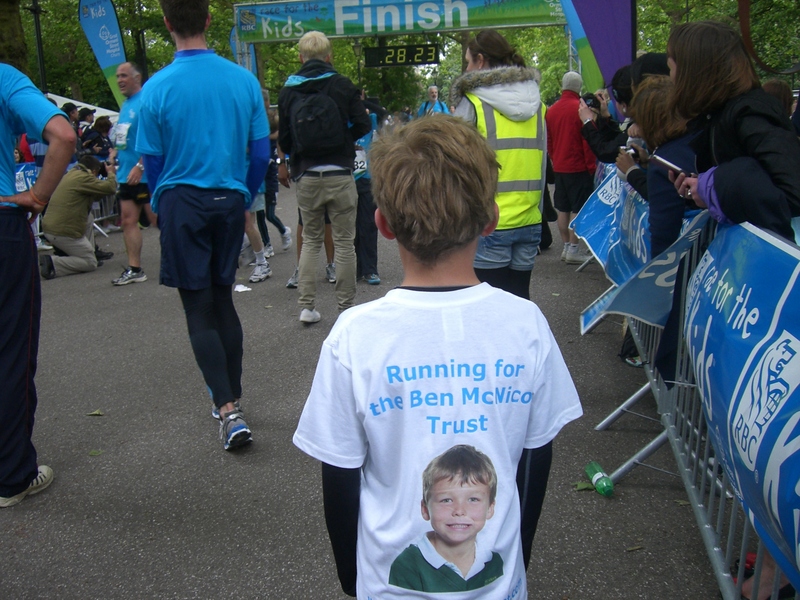 Ben’s cousins participated in a triathlon – swim 400m, cycle 10 miles and run 3 miles to raise money for The Ben McNicol Trust. Please donate! Thank you very much. Visit their JustGiving site to find out more . Do think about signing up and running for the trust in 2015 . 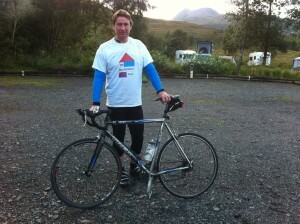 You can sponsor Roddy on his JustGiving page . Check back for further details . 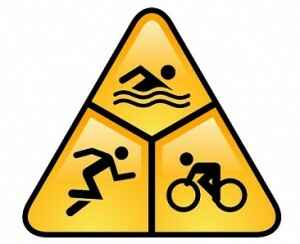 Sponsored English Channel swim – hopefully this is going to happen , no need for volunteers , we have one already ! The Pipers’ Cafe - what a wonderful way to start the fundraising and Ben would have loved it ! 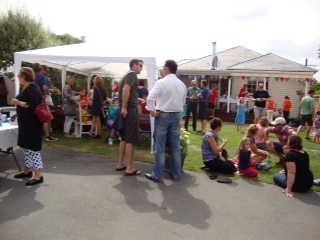 The Pipers generously opened their home and garden and everyone enjoyed the good food and glorious sunshine . 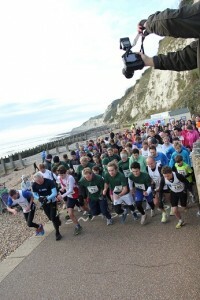 Beachy Head Marathon . Thank you to all who sponsored this event and for the 3 runners ! Austin’s 40th !!! We are very grateful for Austin Grout for his generosity and to all those who attended his recent party and who gave so generously . Susan Winge – Bicknell - a recent afternoon tea raised money for The Ben McNicol Trust . Thank you ! 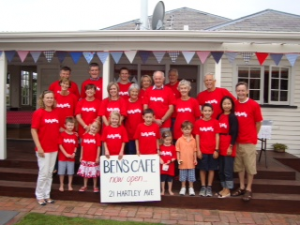 A massive thank you to all who made Ben’s Cafe such an amazing success . So much hardwork from so many people resulted in a fantastic day . We are so grateful that a sum of around $4000 was raised . The generosity and support of the organisers and supporters alike is overwhelming . There are so many people to thank, special thanks to the Wilson and Galt families , other extended family and to many friends . The sun shone in Christchurch on Saturday the 2nd of March for Ben’s Cafe and everyone by all accounts had a great day . 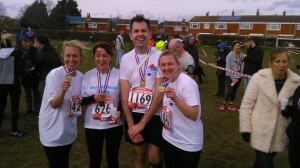 Congratulations to Bev and Austin for completing the Eastbourne half marathon . Thank you also to their support team and those who have sponsored them . If you would like to run to raise funds for the Ben McNicol Trust please get in touch and we will send you a T shirt ! We have a JustGiving page which can be used to help raise funds . If you would like to raise money and add to the events below please get in touch .We are very pleased to have supporters of the Ben McNicol Trust participating in the events below . Why not sign up to one of them or add another to the list . Thanks to Jonathan and Austin for running and for all their kind sponsors ! Thank you so much to Mandy and friends for all the money raised , very much appreciated . 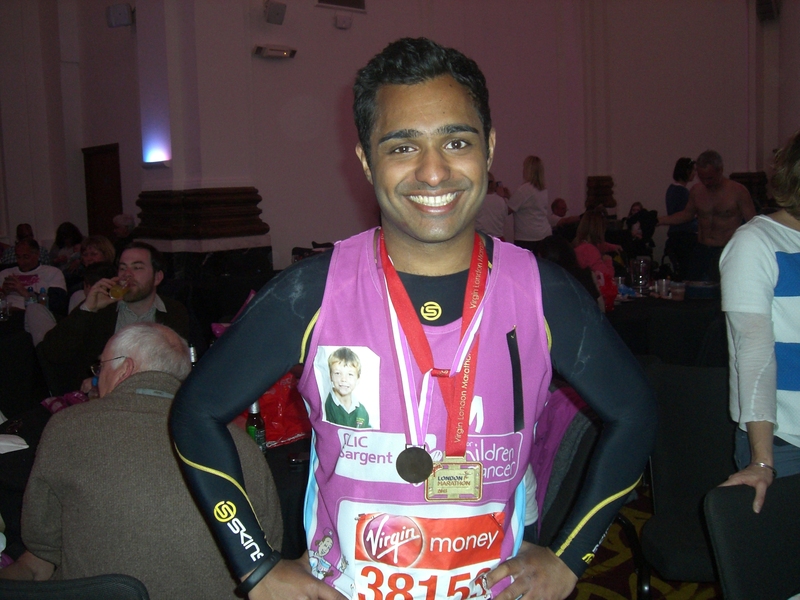 London marathon – we are pleased to support Thomas Manjaly who is raising funds for CLIC Sargent in memory of Ben . Many congratulations to Thomas for completing the London Marathon in 3 hours 43 minutes and 34 seconds! He also managed to raise close to 3000 pounds for CLIC Sargent who do fantastic work in supporting children and their families . The Bristol 10k 5.5.2013 - thank you so much Sarah for a fantastic effort and to all the generous supporters who made a donation to her page to raise funds for The Ben McNicol Trust . Charlotte and Petra’s Tea Party 17.5.2013 – donate on JustGiving or text £amount to TEAP17 TO 70070 to donate now . Thank you so much who attended and donated so generously . The Down Family coffee, cards and cookies day 29.5.2013 10-12pm and 2-4pm – thank you very much for putting this event on and for raising money for the Trust – very much appreciated . Ben’s Footy Fun Day 7.6.2013 - what an amazing success and what beautiful weather . Our thanks goes to so many people, especially to Bev and her team and many others who made it such a fun day for the whole school . On top of that the amazing sum of 1000 pounds was raised . Thank you ! Well done to Tom for completing the course ! Tom completed the run in 26 minutes and 47 seconds . 4000 runners took part in the Race for the Kids . 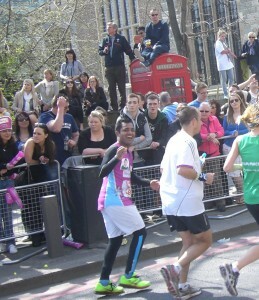 The main beneficiary was Great Ormond Street Hospital for Children in central London . 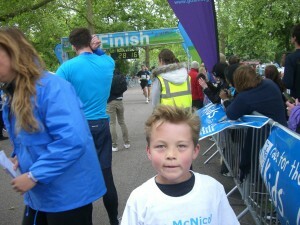 However Tom raised some funds for The Ben McNicol Trust . 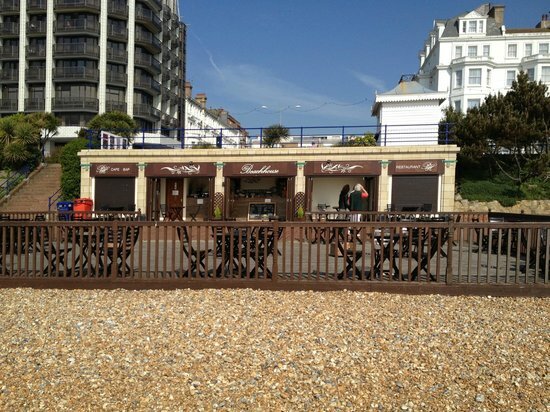 Ben McNicol Trust Quiz Night – 19.6.2013 “The Ship “. What a great evening was had by everyone . Many thanks to all who attended and who gave so generously . £560 was raised from this evening ,thank you ! 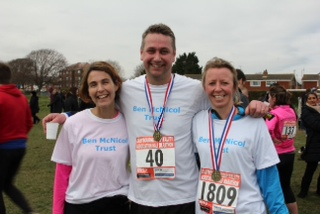 Race for Life 23.6.2013 – 8 runners ran in memory of Ben – thank you . Waitrose June 2013 – during the month of June , The Ben McNicol Trust was one of the charities nominated to benefit from customers shopping at Waitrose – thank you to everyone who put your green token in The Ben McNicol Trust box . Thank you to Waitrose Eastbourne , the sum to be paid to the trust is 549 pounds. Flower sales – thank you so much to Stephanie for raising money for The Trust from the fruits of her garden ! The Standard Chartered 5K Run London 11.7.2013 – support the SEB team , sponsor on JustGiving . British 10k London Run 14.7.2013 – www.thebritish10klondon.co.uk – thank you to all who sponsored and heped raise over 600 pounds . 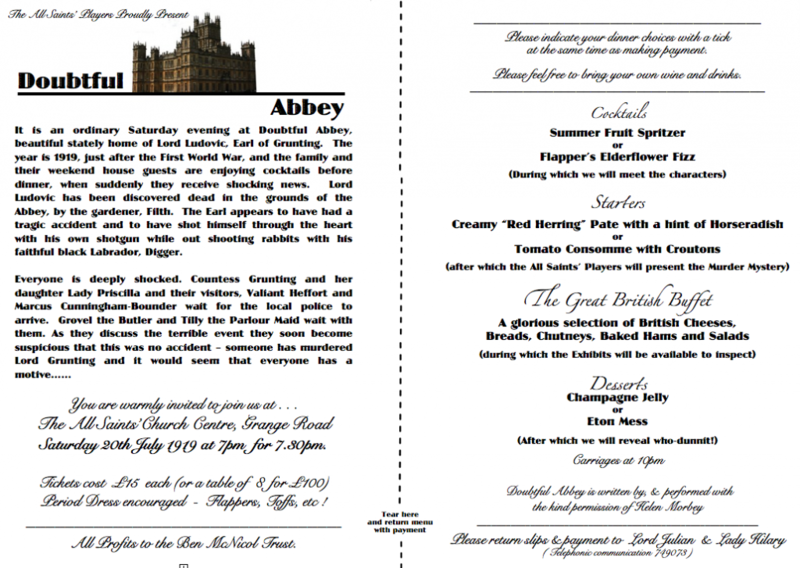 Doubtful Abbey – Saturday 20.7.2013 – a fantastic evening of drama and food was had by all at the event below . Thank you to Julian and Hilary and their army of helpers who made this evening such a success . Over 700 pounds was raised , thank you so much ! Andrew’s birthday – thank you Andrew and everyone who gave so generously through JustGiving and by other means , a tremendous total of over 3 thousand pounds was raised . RideLondon 100 4.8.2013 – thank you to all who supported Danny , through his page on JustGiving . “Coffee , cake and raffle ” 17.8.2013 . Thank you to Elaine and Christopher for organising and hosting this event and for everyone who attended and gave so generously . Thank you to Beth and everyone who filled up Smartie Tubes for The Ben McNicol Trust and for Tesco for their generous donation of the smartie tubes – a sum of over 3 thousand pounds was raised ! Many congratulations to Sandy McDougall and Murray McNicol who cycled the Bealach Mor to raise money for the Ben McNicol Trust. It was certainly more than your average Saturday morning ride , an amazing effort so well done and thank you to them and all the kind generous sponsors . The Bealach Mor is a 90 mile cycle incorporating lots of hills but particularly the Bealach Na Ba pass over to Applecross in Wester Ross. It’s the toughest road to cycle in the UK – rising from sea level to over 2,000 feet in a few miles. However, nothing that two middle-aged, over-optimistic accountants couldn’t handle! Please show your support for this amazing effort by donating through JustGiving , thank you Murray and Sandy ! May be we can reach the 5 thousand pound mark ? Looking forward to more Scottish events in the future ! 7pm-10pm St Elisabeth’s , Victoria Drive , Eastbourne . Thank you to Mandy and all who attended and supported the quiz night which helped to raise funds for St Elisabeth’s and The Ben McNicol Trust . Thank you to our runners who gave so much of there time and energy in running . What a fantastic amount raised , many thanks to all who gave .Please visit our JustGiving site and you can still support one of the runners ! Chris participated as one of 48 swimmers in the Land Equipment Charity Swim on 11 October 2013 at the Elm Park Leisure Centre in Filton, Bristol. Their aim was to swim the length of the River Wye (215km) in 10 hours. The event was overall raising funds for the Army Benevolent Fund (ABF), but Chris very kindly chose to split his fundraising between the ABF and the Ben McNicol Trust.You can still donate through his JustGiving page . 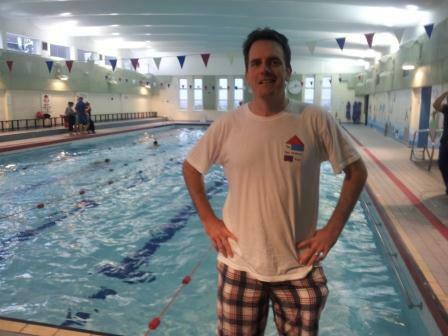 Chris managed to swim 8km which was 320 lengths of the pool over the 10 hours.Thank you so much to Chris for such an amazing effort and also to all his kind sponsors . Thanks to Jonathan Zinn for taking on this marathon for the Trust . 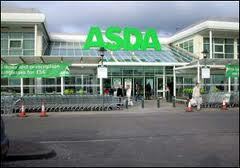 Thank you to Asda for lending their support to The Ben McNicol Trust – if you are shopping at Asda in Eastbourne during the month of November , please consider putting your token in The Ben McNicol box after your shopping . Organised by Meads Runners. Thank you ! 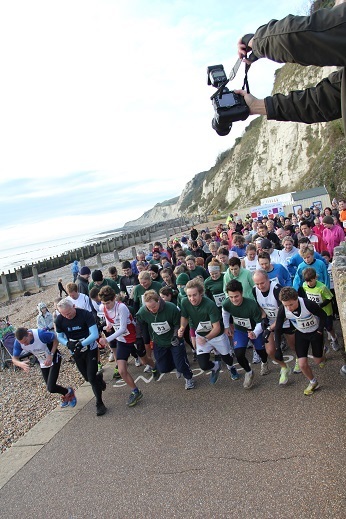 What an amazing success with over 130 runners taking part and over 1500 pounds raised for the Trust . You can still make your donation on the JustGiving site . 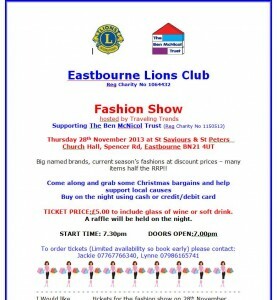 Thank you to Eastbourne Lions Club and all those who attended and contributed to a highly successful and enjoyable evening . Well done to Johanna , running her second half marathon in the same month . Thank you to all who have shown their support already and to Johanna for this fantastic effort for The Ben McNicol Trust . You can support her through JustGiving . Congratulations to Chris ,Nathan , Chloe , Natalie , Johanna and all the Meads Runners on their achievement .You can donate through their JustGiving pages. 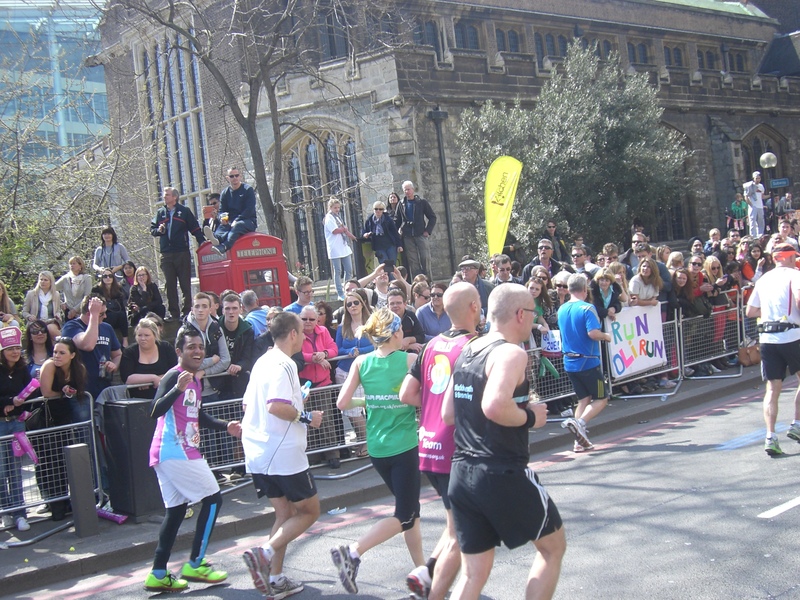 What a fantastic achievement and we are very grateful to Nisha for doing this - thank you for ! You can still sponsor her through her JustGiving page . 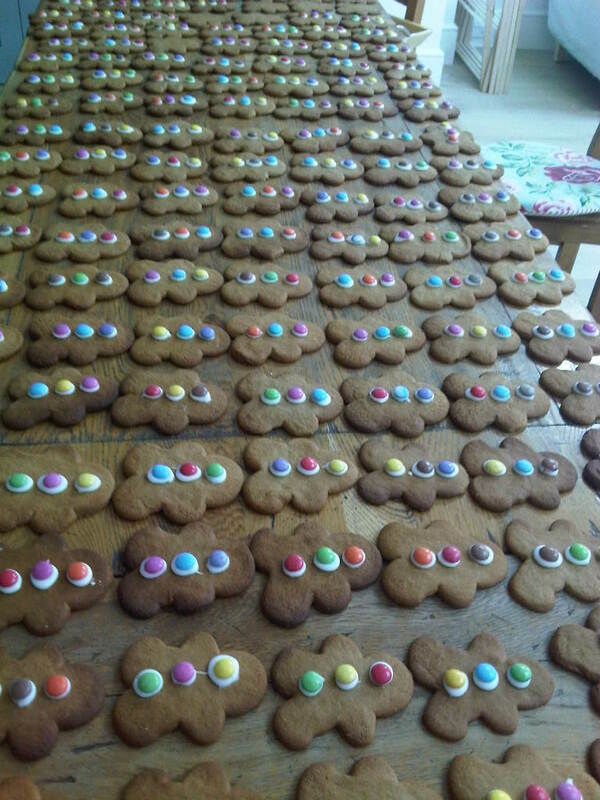 Thank you so much to friends of Ben , Tate and Amanda for raising funds for The Ben McNicol Trust at the Cameron House School Spring Fair in London .They sold gingerbread men at the fair , they look great ! A sum of over 360 pounds was raised thanks to the generosity of those attending the fair . Thank you again Amanda and Tate . Thank you to Bev , Emma and Simon who trained so hard for the Brighton marathon - hopefully the trio will all complete it next year ! You can sponsor them on their JustGiving page .